In my last article, we read about Microsoft Power Apps and their new functionalities available for us, developers and for our end users. Power Apps is the future of Office 365 with various other connections where flow through Power Apps will make complicated processes just a click process. In part 1, we saw an action on creation of an item on the list. In this article, we will see an action on modification of the item in a list. You can create an automated workflow between your apps and services to get notifications or to synchronize files, collect data, and many more functionalities. 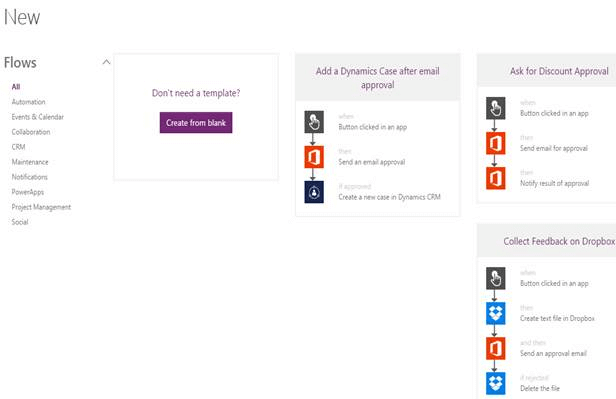 Flows will be the new Workflows which we are using through SharePoint Designer or other third party workflow tools. Now, flow will be a part of them, providing the automotive solutions to all the tasks or processes. Whether it’s a complex multi-step process or a simple one-step task, flows will improve the effectiveness, productivity, and the performance of the process assisting all the end users to get the benefits. Click on “Create a flow” button on the corner. On one click, you are ready to create a flow. You can either create a blank flow or choose from a list of templates as you see on the screen. We will choose a blank form. You will see the screen to choose the action from a variety list of services and products. As for us, we will choose Office 365 SharePoint Sites service and use flow to create a process in SharePoint. 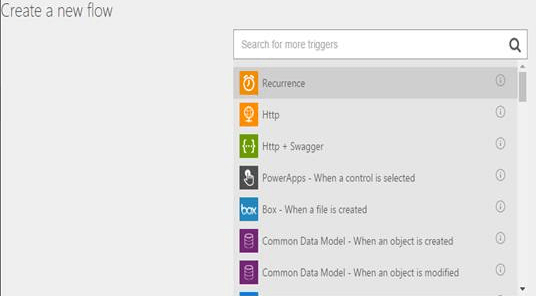 We selected “SharePoint- When an existing item is modified” as a trigger to our flow. Sign in to your SharePoint to connect flows to your site. 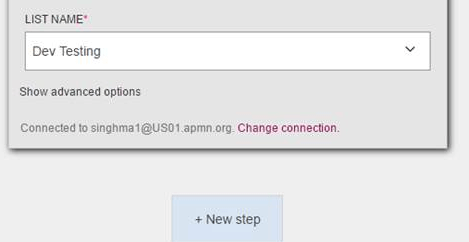 Once connected, provide a site URL. Once you enter the site URL, it will fetch all the lists in the drop down below. Choose the list where the flow will trigger on flow. You can choose what should happen when a an existing item is modified in the SharePoint list. We will create an action. Click on “Add an action”. When you click on action, it will allow choosing actions from a list of services. We will use “Mail- Send email”. This is something amazing you will see. 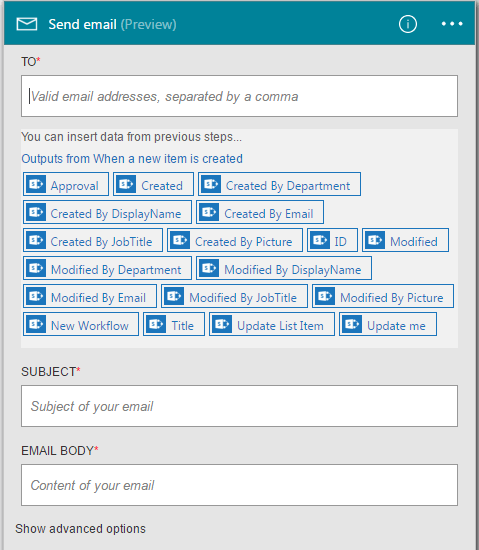 As the email configuration, it allows you to pull in the SharePoint fields to fill in to your email configuration. Once done, click on create and the flow will be created. Go to the SharePoint List “”Dev Testing” and edit an item. The flow will send you an email as soon as an item is modified as shown in the screen below. Isn’t Flow in Power Apps amazing? There is more to come in my upcoming articles. I was able to use this workflow but it only allows me to modify once. The next time I try to modify the SharePoint list it wont trigger. Hi Ceci, you have to modify the flow to send email on item change. This will allow you to send an email on the modify as once. Kindly try from you end and let me know if you face any concern. How I did it was “when an item is created” sends an email then “when an item is modified” sends an email. I was able to accomplish this. It did trigger an email when we modified the list but it will not trigger the second time. There is no Trigger in the Flow “when an item is changed” it only has “when item is modified”. In other words, the “when item is modified” it should loop unlimited. Hi, SO when you change any field, is it not sending any email while you save? Yes, when you change the list the second time it’ll not send an email again when you save. The workflow sends the email only the first change of the list. I need a loop after the – “when item is modified” so that every time you save it, it’ll trigger again and again. Hi Ceci, How are you sending emails using which service? If you use notifications, it is working as expected. I am using Flow Microsoft just as I explained. I use triggers “When Item is created” send email – then – “when Item is Modified” – send email. Once this workflow has been accomplished the workflow stops at the end. It will not loop to the trigger ” when item is modified – send email again. I need it to loop on that trigger. How does the loop work? You need to create two flows, one for creation and for modification, Can you try creating two workflows and try if it is working as expected.